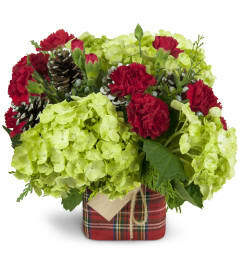 Spread holiday cheer with a fun, festive bouquet - the perfect finishing touch for your holiday decor! Presented in a charming red ceramic bubble bowl for a gift that keeps on giving, year after year. 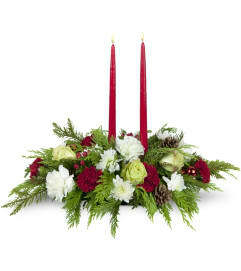 Red and white carnations are arranged with peppermint carnations, mums, and sprigs of pine in a delightful Christmas display. Container design may vary based on local availability. Flower Shop smells absolutely wonderful. Best quality in Town. Owner Joanne is Fantastic. Great service! Nice staff and they had exactly what I needed this and every time I have been there! 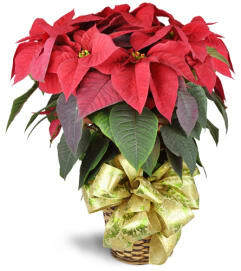 Grower Direct is a Lovingly Florist in Red Deer. Buying local matters. Discover how Lovingly supports local florists. Copyrighted images herein are used with permission by Grower Direct.